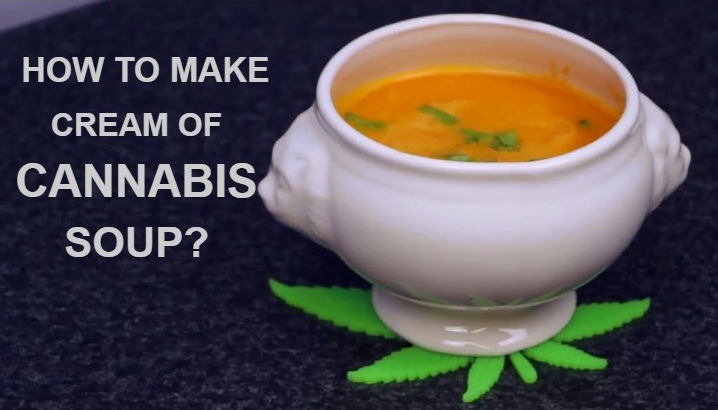 Cream of Cannabis soup is definitely something of an upper-class marijuana dish, reserved for dinner parties and when you want to impress someone, including yourself. Cream of cannabis soup is a warm and nourishing dish in many ways that can leave you completely satisfied. This can also be the perfect recipe for those who are feeling a little under the weather, particular to battle colds and flus. This recipe feeds 6 people, so be careful how much you are actually making. This recipe also uses cannabis butter to spare you the effort of making your own medicated butter or oil, which can add complexity to any recipe. Trim the roots off of the leeks and leave only the white part and an inch or two of green. Run the leeks and split them lengthwise and slice crosswise. Sauté the leeks in the canna butter and butter for about 12 minutes or until they’re soft. Add in the potatoes, salt, pepper, and the chicken broth and bring the mixture to a boil. While this mixture cooks, trim the asparagus tips off and set them aside if you are using a garnish, otherwise you can throw them away. Move the soup to the food processor (or a blender if you don’t have a processor) and blend them until they are all pureed. Put the soup in a clean saucepan and add in the cream. Mix thoroughly. Your soup is now ready. If you are using a garnish then put the asparagus tips in salted water and cook for 3 or 4 minutes. Drain well and garnish each serving with the asparagus tips. Enjoy!